Disclosure: I received a mattress for review purposes. All opinions on this blog are my own. This post contains affiliate links. 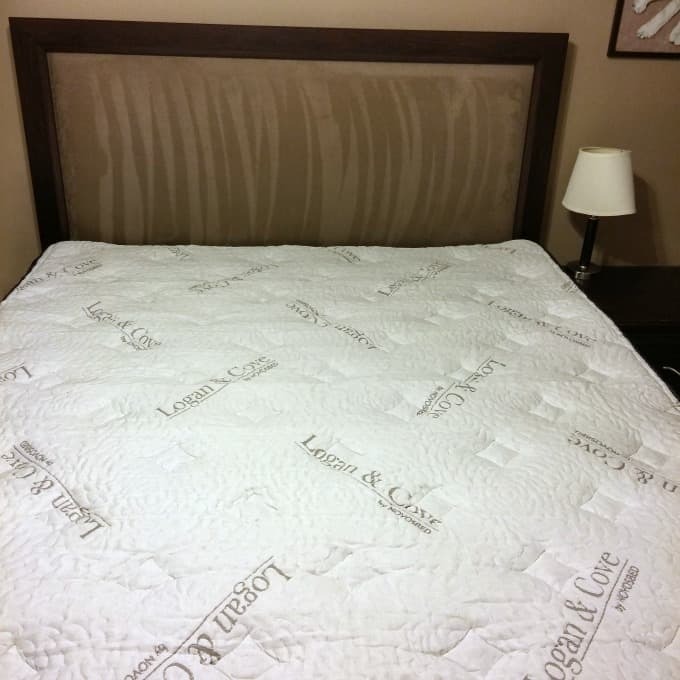 We are thrilled with our new Logan & Cove luxury mattress. Deciding that it was time for a new bed was easy. Our previous mattress, which was a substantial investment at over $2,000, had not stood the test of time as promised. Needless to say I was disappointed. Like any careful consumer, I had done my research and considered myself quite well-versed in mattress construction and quality. I had even spent time selling mattresses where product knowledge was key to meeting customers’ needs. When we purchased our pillowtop mattress with foam-encasement and pocket coils that came branded with a reputable name we thought we had made a smart choice. Fast-forward a few years when the sleep guarantee has long expired, and there we were, rolling into the center of a bed that lacked support in the middle where our hips would rest. Each morning I would wake with a sore lower back. I became an unintentional yogi, needing to stretch in various poses before beginning my day. Thank goodness for my devoted husband who willingly tried to relieve my discomfort with routine massages. As nice as that was, I knew the mattress had to go. Deciding which mattress to purchase was not going to be easy. I understood the support offered by a mattress designed with innersprings but I was skeptical after our last experience. I also craved the comfort of a pillowtop. The idea of one made completely with memory foam was enticing but I worried that it too would become too squishy over time. I began reading about gel layers that aid in regulating temperature. That made the priority list for my “hot” husband. And this time I’m not referring to his dashing good looks. He was always complaining of being too warm in bed. Where would we find cushioned comfort and consistent support at a reasonable price? 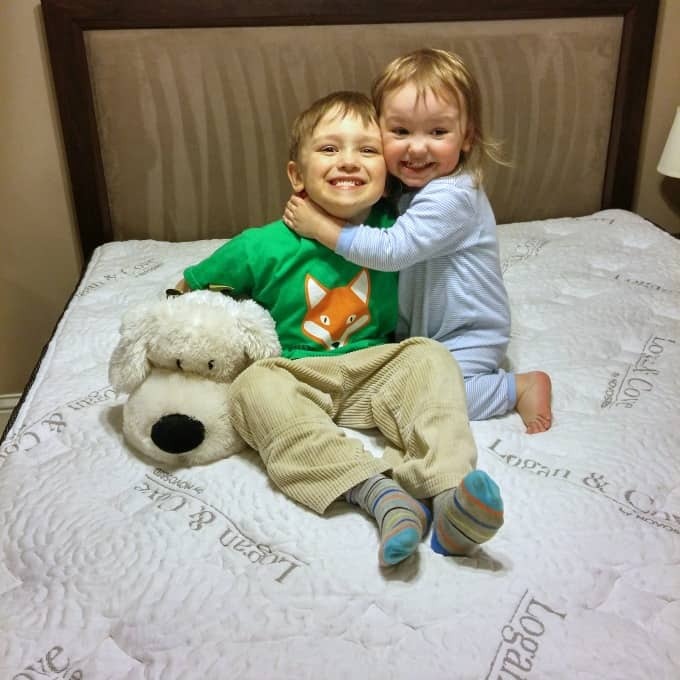 Logan & Cove’s luxury mattress checked all the boxes on our wishlist. There couldn’t have been more impeccable timing to seek input from my friend about choosing a mattress. She told me about the hybrid design of Logan & Cove’s new bed. I was impressed that the queen size model of such an innovative bed was selling for less than a thousand dollars. Immediately I checked their online store to learn more. Here is where I was reassured by the 120 night sleep trial, the longest I’ve ever encountered in all my research. The internet has afforded us the convenience of being able to comparison shop much more than before, and Logan & Cove’s online store is always open. That is good news for a busy, working mom like myself. Shopping the old-fashioned way is difficult to squeeze into the schedule. Groceries and essentials make the cut, but I didn’t have time to bed-hop at the retail locations. When I found out that Logan & Cove would deliver right to my door in a matter of days they really got my attention. When I realized the luxury bed I had chosen was actually a mattress in a box, I must be honest, I was hesitant. How could this be? I read about the engineered packaging and couldn’t justify not giving this a try. 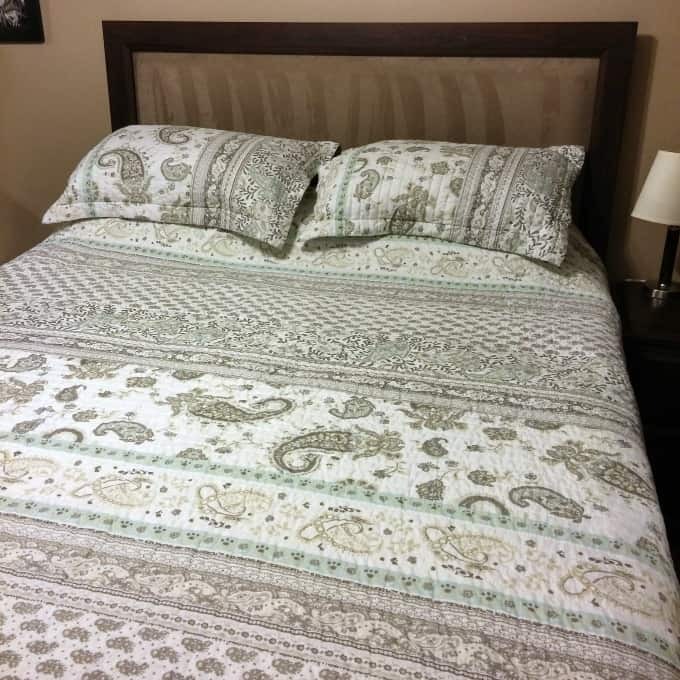 The price, the construction, the convenience, the sleep trial, not to mention how beautiful it looked, these were all the reasons we opted for the luxury pillow-top mattress from Logan and Cove. And this mattress is made right here in Canada! Within days our new bed had arrived. My husband carried it in from the front porch by himself. There was no need to borrow a truck and an extra person to help pick up our new mattress like we had done each time before. 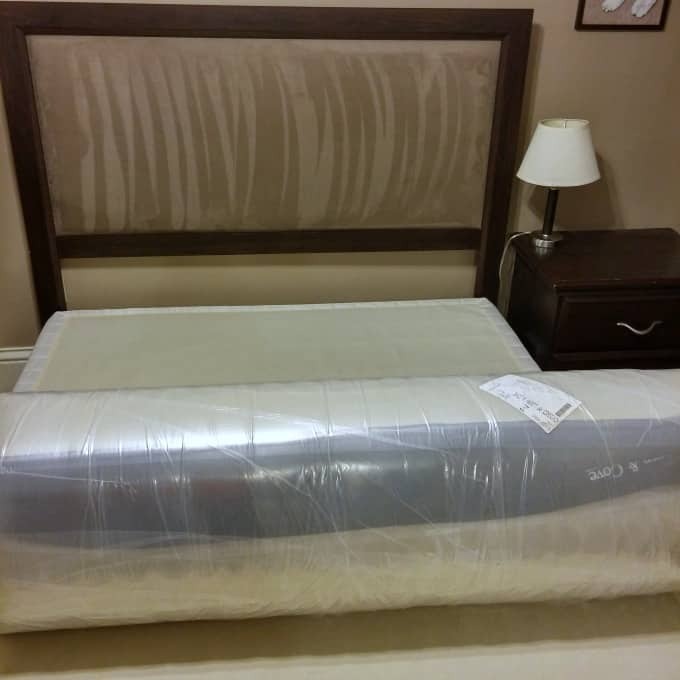 Since the Logan & Cove mattress is packaged so effectively, there was also no need to re-arrange furniture in order to clear a pathway to get to the master bedroom. We easily maneuvered the box around the corner on the staircase of our century home. When they built these homes, they certainly didn’t anticipate how big beds and furniture would be in the future. The hesitation we previously had about purchasing a mattress in a box was quickly put to bed. The whole process of bringing it in and setting it up took about ten minutes. It really was easy. Sleeping on this mattress has definitely been luxury. The memory foam in the pillow-top is so comfortable and you feel very supported by the pocket coils. When our two young children climbed in with us we were able to squeeze right over to the edge to make room, without feeling like we were going to fall out of bed. Nobody was rolling into the center and my husband stopped complaining of being too hot. The most noticeable improvement for me has been waking up without the lower back and hip pain I had come to dread each morning. And to think I was perceiving those pains to be signs of aging. I actually feel rejuvenated when I wake up in our new Logan & Cove mattress. It has turned our master bedroom into the sanctuary of relaxation it should be. When we had guests recently, we offered up our room so that they could give the new bed a try. I should add that this is a senior couple, both in their seventies, one of whom struggles with sleep regularly. They reported having a wonderful sleep and made sure to write down the name. I know it has only been about a month, but I am already so impressed with my sleep quality. I trust that this mattress will stand the test of time; it comes with a fifteen year warranty! 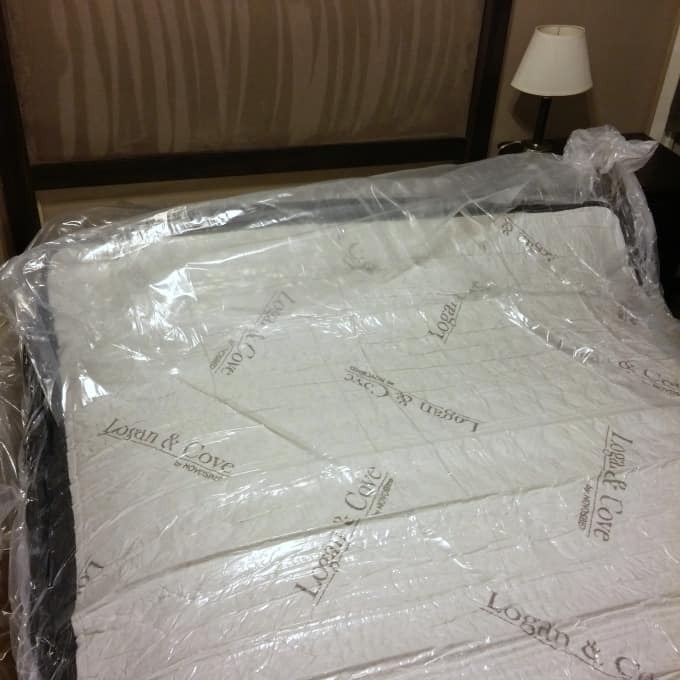 We are absolutely delighted with Logan & Cove’s luxury mattress and recommend it without hesitation. I feel like Goldilocks when she finally tries out Baby Bear’s bed; this one is just right. Guest post by Tina. She is the mom of two young children, a boy and a girl. She enjoys reading, camping and spending time with her family. Logan & Cove is hosting a giveaway! Enter on the form below. Please note this giveaway is being administered by the sponsor. Love this mattress, so elegant yet comfy looking. I am interested in this wonderful mattress. I don’t know about the price though. I’ve been seeing so many boxed mattresses these days… all I can think about is how convenient these would’ve been for me when I was renting! 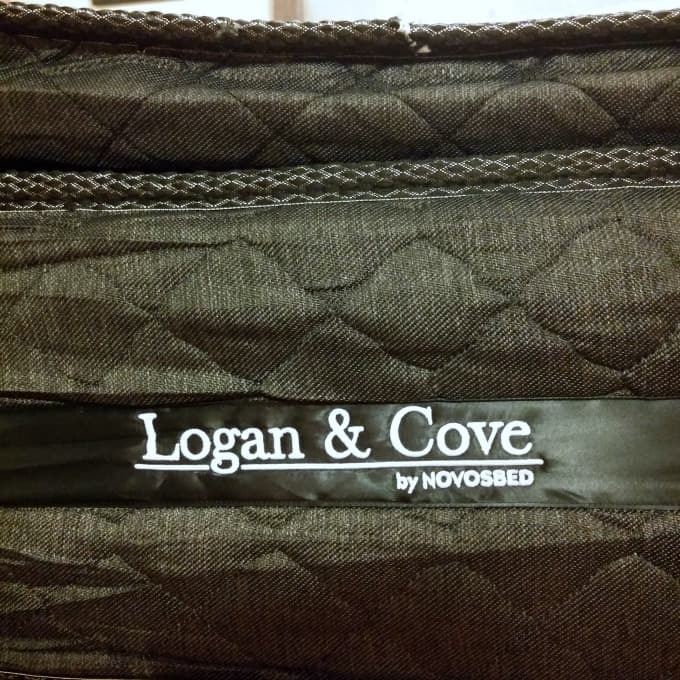 These Logan & Cove mattresses sound pretty good. This would be the perfect mattress with the silk pillow top and the individual coil springs that give you a firm mattress. I love affirm mattress and it is the first thing I look for when shopping for one. This sounds so perfect and is probably the best quality mattress on the planet. 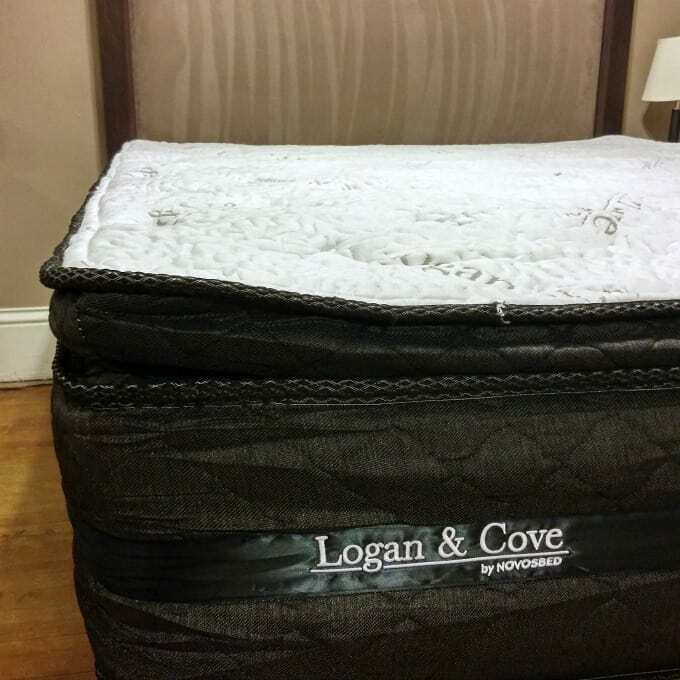 I would love to try the Logan and Cove luxury mattress. I am considering this mattress, but waffling. What did you place yours on … a boxspring? Yes, she used a boxspring.